Bee marked playing cards, are the high-quality Bee playing cards finely processed by our professional technicians with advanced playing cards marking machine and the special invisible ink. As the world's leading casino poker brand, Bee has been setting the standard for good quality playing cards these years. 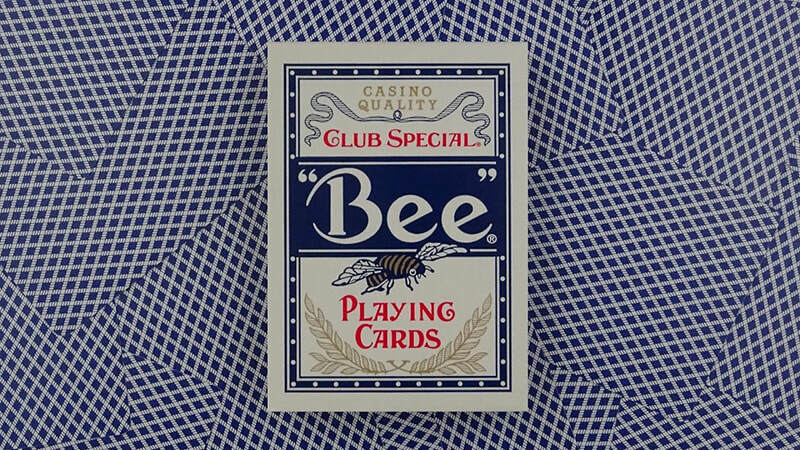 Bee playing cards is made by one and only incomparable paper pulp, in 1892 by the United States playing cards company to create a brand. Normally, we produce two types of Bee marked playing cards, Bee back marked playing cards ( the marks, indicating the suits and numbers, can be printed in the middle or on the white board of the card backs ) and Bee edge marked playing cards ( the marks, indicating the barcodes, are printed on the card edges ). We can also make the marks according to your reasonable requirement. with the growing popularity of BEE cards, invisible BEE cards marking is of great importance for many people who like to play poker games with BEE cards. By a procession of shading, the marks of invisible BEE cards marking in luminous ink can be seen by infrared contact lenses and ultra luminous sunglasses. Our naked eyes cannot see the mark on the back of invisible BEE cards marking Invisible BEE cards marking have three types of patterns. One is a jumbo and suit in black on the center, the other one is four small fonts in black on the corners, and the last one is that you can customize specified marks as you want. We all know that only making good use of invisible BEE cards marking with superior quality can bring a lot of advantages in different poker games like Holdem, Omaha, Baccarat and other kinds of poker games. In the first place, you can know what cards your opponents have. According to the cards they have you can find the surest way to win the games. Secondly, you can bet the biggest winner if you are not the players. With the sleight of hand, you can get what you want. More importantly, you can receive complements from your friends and opponents who once laughed at you when you lose your games many times. Winning in the poker games dose not only simply make you become richer but also greatly strengthen your self-esteem and self-confidence which give you a promising and happy future beyond your imagination. So magical and fantastic the invisible BEE cards marking are. Owing it is owing the whole world. We offer any BEE playing cards with regular index or Jumbo index. Also some other BEE decks with the small animal bee on the back of the cards. Also you can send us your Bee playing cards to mark for infrared contact lenses or poker analyzer for you.